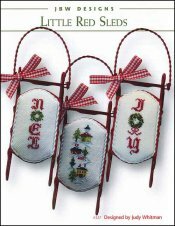 Little Red Sleds [H1901] - $10.00 : Yarn Tree, Your wholesale source for cross stitch supplies. Cross stitch pattern by JBW Designs. Three sled patterns. The verses "Noel" and "Joy" are featured on two sleds. On the third sled, a Christmas scene is featured. Stitch count: Noel 10 W x 45 H, Christmas VIllage 19 W x 54 H, and Joy 15 W x 52 H. Stitched on #2181 Belfast Linen antique white. Ornament sleds are #8423.